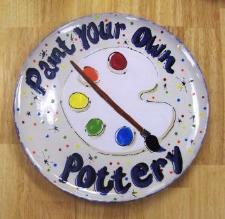 A Paint-Your-Own-Pottery studio where you can come in, relax and create your own personalized works of art. Come in and see why we are one of the favorites of the seacoast to enjoy some good art “therapy”! huge selection of pottery and start painting! No studio fee! Price of our pieces include all you need to paint and fire. We have a huge selection of pottery to choose from... something for everyone! All ages welcome and no experience necessary, we're here to help. With a group of 6 or more please call ahead to have a perfect spot ready for you. Plenty of space for everyone. Birthday parties at Firefly are so much fun! We take such good care of you, your family and friends. Click here to read more! We offer classes in pottery technique painting, wheel throwing, clay hand building, wine bottle lantern making and wine glass painting. We even offer Canvas painting! Click here to read more! Our camps are so cool! We like to offer projects that use all the art mediums our studio has to offer. For kids and grown ups alike! Plan your own special party or gathering at Firefly! We have plenty of room for you, your family and friends. Click here to read more! Create stunning Glass Fused pieces by layering colorful pieces of cut glass. Create jewelry, ornaments, sun-catchers and night lights. Plates and dishes too! Click here to read more! Our "Clay Bar" is always open to play with clay. Follow one of our pre-designed patterns or create your own clay art! Click here to read more! Want to learn to throw on a clay wheel? Make your own bowls out of clay to paint and enjoy. Imagine serving food from your very own hand-made bowl! Click here to read more!